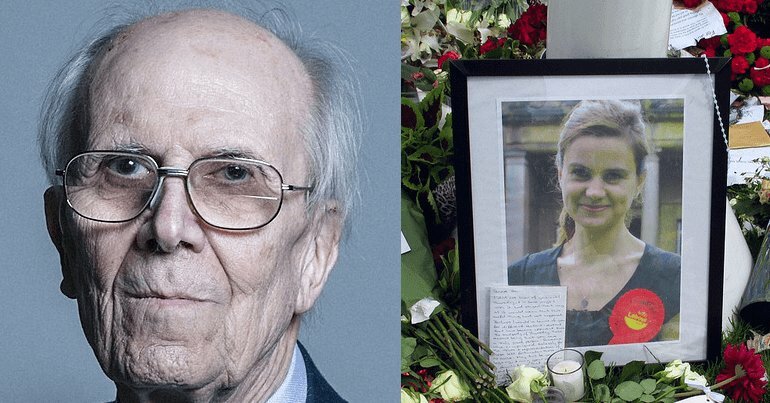 Conservative peer Norman Tebbit has insulted the memory of Jo Cox MP with Nazi propaganda. On 16 June 2016, Thomas Mair shouted “Britain First” as he shot and stabbed Labour MP Cox while she was going to meet her constituents in West Yorkshire. But, during a parliamentary debate on counter-terrorism, Tebbit said that Mair was actually not a “far-right terrorist” but a left-winger. Tebbit came to such a conclusion because Mair was “obsessed” with the Nazis, whom Tebbit claims are left-wing. But just because the Nazis called themselves the ‘National Socialist German Workers’ Party’ doesn’t mean they were socialist. Just like the North Korean ‘Democratic People’s Republic of Korea’ is hardly democratic. The Nazis branded themselves as socialists to try and poach supporters from popular socialist and communist groups at the time. In other words, Tebbit is parading Nazi propaganda in parliament to score political points over the murder of a Labour MP. The noble Lord referred to the murder of our parliamentary colleague Jo Cox by a far-right terrorist. He was not a far-right terrorist. The House of Lords member doesn’t seem to live in reality. Only last week, thugs left a prospective Labour council candidate bloodied and concussed for five days because of her politics. They called young mum Jade Unal a “Labour c***” while they beat her after she left a Labour talk on Brexit. In 2016, Mair murdered Cox for her politics. She was a campaigner for the rights of refugees. Yet Tebbit is invoking Nazi propaganda to make political capital over her memory. Hang your head in shame, Lord Tebbit. – Check in on advocacy group Hope Not Hate.